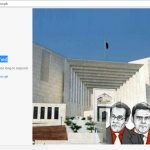 Following the Panama Case verdict, the website of Supreme Court of Pakistan has crashed restricting information access to judiciary-related public data. Millions of Pakistani’s were glued to televisions and social media as the Supreme Court of Pakistan gave its verdict on Panama Case. It was decided to form a Joint Investigation Team (JIT) for further proceedings. Shortly after the verdict came out, Supreme Court’s website was found not responding. www.supremecourt.gov.pk is the official website of country’s most powerful court, the Supreme Court of Pakistan. It provides important information like details of honorable judges, a list of pending cases, orders and even a feature to check online the status of pending cases. Apparently, the website administrators were not ready for a hike in the traffic which led to service interruption. As of April 20, 2017, Supreme Court’s website is the 1,715th most visited site in Pakistan. According to Alexa, the most popular website analytics company, the Supreme Court website receives well over 200,000 hits every month. The website receives about 90% traffic from Pakistan followed by India, which contributes 1.4% visitors. The remaining percentage makes up visits from rest of the countries. Over the years, the Government of Pakistan has made a substantial progress in renovating and securing important government and state websites. In 2013, the Ministry of Information Technology and Telecom had advised ICT R&D Fund to improve the websites of various ministries.